A fun way to stay active. Forget about New Year’s Resolution, try making a summer resolution instead. There is a feeling when we begin a new year and pull out a new yearly calendar that we also need to start with new habits that will improve our life and help us lose weight. However, this not an ideal time to make habit changes. January is in the middle of winter; the weather is cold and the days are short. It is more natural to make habit changes when the seasons begin to change. As summer months begin, the air begins to become warm and the days become longer. This is a time when small habits are easy to change as we naturally want to change with the season. Here are some easy healthy habits that can help you lose weight and improve your overall health in the summer months. It is important to stay hydrated in the warm summer months. Try replacing sugary beverages with fruit infused water. There are endless possibilities when it comes to adding a bit of natural sweetness to your water. Try fresh berries, melons, lemon, lime, cucumbers and even mint. There are even convenient water infusers to help you add your favorite fruits to your water. With the days being longer and warmer weather, evening walks seem more tempting then evening walks in the middle of winter. Try making the habit of going on an evening walk right after dinner, and before you begin the dinner clean up. Research suggest that gentle walks after dinner actually helps your food digest. Start off with a quick walk around the block. Even a quick 10-minute walk can make a huge difference to your weight loss success and your overall health. In the summer months, our bodies naturally crave foods that are cooling and with so many fruits and vegetable in season, eating plenty of fruits and veggies can be more accessible. This is a great time to enjoy a refreshing salad for dinner. Other lighter options can include a refreshing chilled soup like gazpacho. If your grilling outside, grilled meat and vegetables are good options, while choosing lighter meats such as poultry or fish. So many delicious fruits are in season in the summer months like, peaches, apricots, plums, nectarines, melons, and blueberries. Sweet fruits are a perfect replacement to curb that sweet tooth. Practicing mindful eating is an important tool in losing weight and maintaining healthy eating habits. In our busy lives we often find ourselves eating too quickly, not chewing our food thoroughly, and not paying attention to what we are eating or how much we are eating. Eating mindfully allows us to pay attention to our bodies and what we put into our bodies. It allows us to notice hunger and fullness signals and allows us the opportunity to enjoy and savor our food. Here are some mindful eating tips you can do to help incorporate into your daily practice. · Stop eating when you feel full. · Observe how certain foods make you feel. · Set aside meal times to avoid eating on the go. · Sit at the table during meals. · Avoid watching TV, reading, or being on your phone during meals. · Eat on plates, not out of boxes or bags. · Set the table with flowers or candles to create a relaxing setting. · Practice gratitude. Give thanks for those who grew, harvested, and prepared your food. · Slow down while chewing. Try chewing each bite 20 times. · Try putting your fork down in between bites to help savor your meal. Exercise and a healthy diet is often what one thinks about when trying to lose weight, but have you ever considered sleep an important part of your weight loss regime? In fact, research has shown that sleep is an important part of weight management. It was found that those who get enough sleep had a lower BMI than those who did not, suggesting that sleep deprivation can cause one to gain weight. Sleep plays an important part in regulating several hormones in your body. Two important hormones, Leptin and Ghrelin, play a key role in stimulating and suppressing your appetite. Leptin is responsible for suppressing hunger, while Ghrelin increases appetite. Lack of sleep has been found to decrease the Leptin level, while increasing the Ghrelin levels, causing an increased appetite during the day. Sleep also helps to lower cortisol levels or the “stress hormone.” When you have high levels of cortisol, it triggers the fight-or-flight response, which shuts down the bodies normal functions and activates the fat storage that releases sugar for energy. That increase of sugar then triggers the cravings for foods that are high in sugar and carbohydrates. The next time you find yourself waking up from a sleepless night, pay attention to your eating habits and cravings. When you wake up tired you will more likely want to go for the coffee, then a donut or sugary or high carb food. You are less likely to have the energy to exercise when you are tired or sleep deprived. As you continue on your weight loss journey, try including healthy sleeping habits into your daily routine. Here are some helpful tips getting more sleep each night. · Try reading a book before bed. · Write down a to-do list at night to help keep your mind clear of all that you need to do the next day. Is weighing yourself every day a good thing? Does weighing yourself help keep you on track or does it cause a sense of frustration? Some weight loss experts say to weigh yourself in the morning to help manage your weight, whiles others claim to avoid the scale and goby how you feel and how your clothes fit. So which way is correct? Well I would say it depends on your individual personality. When trying to lose weight, the accolades you receive by seeing the numbers decrease, can help continue to motivate you through your journey. But how does that make you feel when the scale goes up or stays the same? Does the help motivate you or does this affect your mood? I personally weigh myself every day as a “check and balance” system. However, I know exactly what the scale is going to say even before I step on it based on how my body feels. When my numbers go a little higher than I like, I put myself in check with what I eat. If the numbers are lower or where I would like to be, I find that I give myself permission to overindulge a little in foods that I would normally be avoiding. Could the scale be to blame for the constant ups and downs in my weight? Take a moment to see how the scale impacts you. If you find weighing yourself is negatively impacted by the scale, try these tips to help measure your weight loss success without the scale. 1. Look in the mirror. Are you seeing improvement in the way you look? 2. Clothes test. How are your clothes fitting? Many times the scale does not reflect the inches you have lost. 3. Energy Level. When you shift to a healthy lifestyle, lose weight and eat healthy, your energy level often increases too. 4. Self-confidence. How are you feeling about yourself? As we lose weight, we begin to feel better about ourselves. 5. Daily habits. Focus on sticking to your healthy habits by eating healthy and moving your body. Eating breakfast not only helps you lose weight, but helps you maintain a healthy weight. Studies have shown that breakfast eaters tend to eat fewer calories throughout the day, have lower cholesterol and overall better health than those who skip breakfast. When you skip breakfast, your blood sugar drops causing you to become hungry and have less energy. When you allow your body to get to the point of hunger, you set yourself up for impulse eating, binge eating or making unhealthy choices. Eating a healthy breakfast will make you feel nourished and satisfied, making you more likely to make good choices for the rest of the day. A breakfast high in fiber and protein is an essential part of your weight loss program. A breakfast high in fiber helps reduce your calorie intake and provides a feeling of fullness. A breakfast high in fiber also helps to reduce glucose levels and helps to reduce the risk of diabetes. A breakfast high in protein will digest slower and provide energy for a longer period of time. Studies have shown that a breakfast high in protein can reduce snacking and help control your appetite throughout the day. By walking just 10-20 minutes a day you can make a big difference in your overall health. A body in motion stays in motion, and a body at rest, stays at rest. · Choose a parking spot further away when out shopping or at work. · Take the stairs when available. · Take 5 minute breaks to walk during the day. · Walk during your lunch break. · Walk for 10 minutes before or after dinner or before cleaning up the dinner mess. · Replace your cup of coffee with a brisk morning walk before you get ready for the day. There are many health benefits when it comes to drinking water. Drinking water is an essential part of any weight loss program. Drinking water can help to increase the rate in which your liver burns fat. Water can also help control the intake of excess calories when replacing a high calorie beverage with water. · Water helps maintain the proper balance of fluids in the body. Proper balances of body fluids help support a healthy digestion system, circulation and maintain body temperature. · Water helps support the kidney by cleansing and ridding your body of toxins. · Water helps maintain normal bowel movement and helps prevent constipation. · Water helps fuel muscles to help increase energy and productivity. 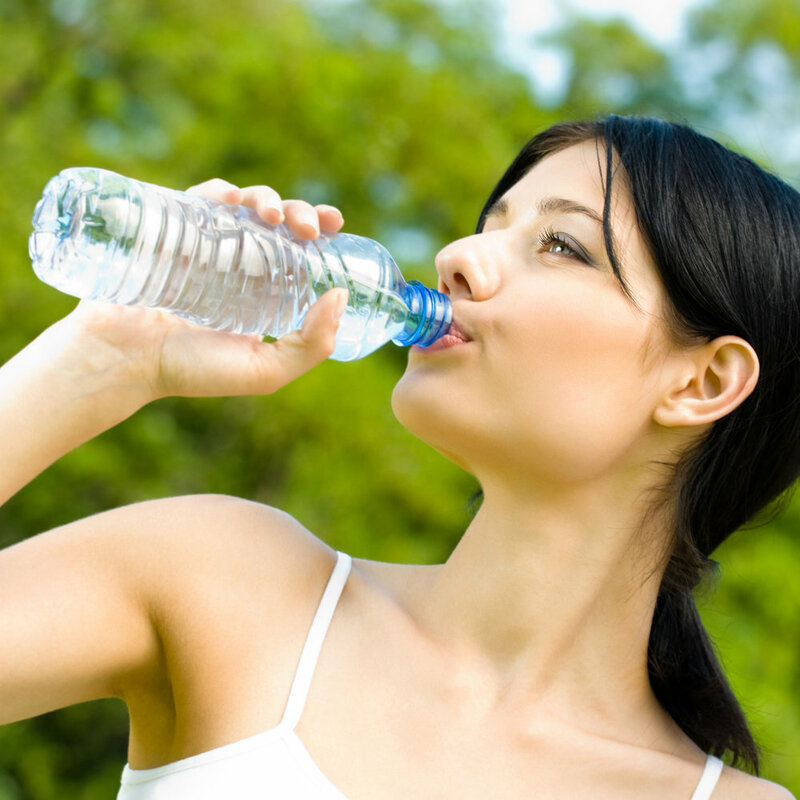 · Water helps to support healthy skin. It is recommended to drink at least 8 glasses of water a day. If you find yourself having difficulties drinking water, try some of the following ideas to increase your water intake. · Try drinking your water room temperature. · Add lemon to your water if you need a little flavor. If lemon is not your favorite, try adding fresh berries to your water. · Drink warm or iced herbal teas. Experts say aim for at least 30 minutes of exercise a day, or 10,000.00 steps a day. If you’re new to exercise, start slow, try breaking into 2-15 minute sessions then work up to 1-30 minute session. Walking is a great exercise if you don’t belong to a gym, and you can walk practically anywhere. Strength training is also great. It helps build muscle, which helps build your metabolism. Try walking for 15 minutes and strength train the remaining 15 minutes. Any type of movement is beneficial. Park farther away from where you run errands. Take the stairs. Get up from your desk and walk for 5 minutes. The more you move, the more, in time, you will want to move!! Did you know that dark chocolate is actually good for you? It is one of the best sources of antioxidants. It also contains soluble fiber and minerals. Studies show that dark chocolate can improve health and lower the risks of heart disease. A long term study in Germany showed that having a small square of dark chocolate every day lowers blood pressure and reduces the risk of strokes by 39%. How can you eat chocolate and still lose weight? Researchers in Copenhagen found dark chocolate is more filling and more satisfying than other chocolates. It can also reduce the metabolic effects of stress. Dark chocolate lessens cravings for sweet, salty, and fatty foods. Eating a small amount of chocolate can actually help reduce your appetite and prevent sugar spikes. Now that doesn’t mean you can just go have a big bar of chocolate. Choose a chocolate of high quality, one that has 70% or higher cocoa content. Also choose a chocolate that has cocoa solids listed first, not sugar. The darker the chocolate the less sugar it contains. So go ahead and enjoy a small square of dark chocolate!